If I may offer a counter-example to my own “the monoculture is doing just fine” post of yesterday, there’s one example of a grand national unifier that strikes me as less unifying every time I watch. That would be The Price Is Right. I’ve been watching The Price Is Right off and on since I was a kid, and I’ve watched it more lately because my son is a game show fanatic. He’s watched every episode on my four-DVD Price Is Right set multiple times, and over the summer he watched the Drew Carey-hosted version just about every day. 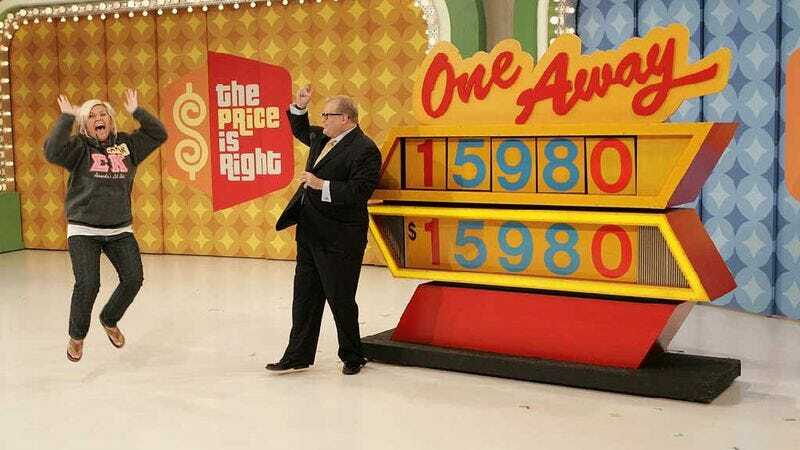 When I was a young man, I was pretty good at gauging what everything should cost on The Price Is Right, and even now when I watch the ‘70s episodes, I can roughly estimate the cost of a car or a gazebo or a box of Noodle Dinner. But when it comes to the current show? Man, I have no idea what pricetag to stick on anything. I’d feel bad about this, except that I’m not alone. When I watch the new episodes of The Price Is Right, I’m constantly amazed by how wildly off the mark the contestants are. In the showcases especially, contestants overestimate or underestimate the actual retail price of their prize packages by tens of thousands of dollars. Partly that’s a function of the kinds of contestants on the show these days. In the ‘70s, The Price Is Right was largely populated by housewives, who were more attuned to the price of toilet cleaner and wall-to-wall carpeting. These days, the show has been overrun by college students, who whoop to their friends and wink at the camera and barely seem to register that there’s a burly man on stage asking them questions. But I also think that generally speaking, we’re less aware of what things cost, perhaps because so many of our transactions are electronic, and conducted at places that offer deep discounts on the MSRP. Plus there’s such a range of prices on otherwise similar items. I went shopping for an iPod-enabled clock radio the other day and found some that cost about 30 bucks and some that cost 300. And the difference in functionality between the high and low end didn’t seem so vast. I have a rough idea of what a car costs (and what gas costs, though that’s not an issue on The Price Is Right), and I go grocery shopping every weekend so I know what I should pay for Rice-A-Roni. But throw in a personal computer, a trip to Hong Kong, a jet ski, a hot tub, a sofa and a Cartier watch and I become like Dustin Hoffman in Rain Man. How much is a TV? About a hundred dollars. How much is a candy bar? About a hundred dollars. Am I alone in this? Or is the actual retail price for consumer goods becoming one of those things that varies so wildly that it’s hard to transform it into a question with a right or wrong answer?